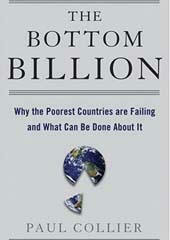 Published on the heels of Jeffrey Sachs’ The End of Poverty and William Easterly’s White Man’s Burden, Paul Collier presents another, more balanced, view of the causes of and solutions to poverty in his book, The Bottom Billion: Why the Poorest Countries are Failing and What Can be Done About It. Integrating anecdotes from his professional life as former director of development research at the World Bank and as advisor to the British government’s Commission on Africa, with rigorous econometric analysis (conducted during his current academic life as Professor of Economics and Director of the Center for the Study of African Economies at Oxford University), Collier focuses on the plight of the poorest billion people on the planet, the vast majority of whom reside in Africa. Collier attributes the extreme poverty of the fifty-eight countries that harbor the poorest billion individuals to one, or a combination, of four “traps”: a conflict trap, a natural resources trap, the trap of being landlocked with bad neighbors, and a poor governance trap. Together these traps are causing the divergence of the poorest nations from the rest of the world, and left to their own devices, these countries will likely end in “a ghetto of misery and discontent” (p. xi). As a whole, these countries are poorer than they were in 1970, and their people live for an average of 50 years, seventeen years less than the rest of the developing world. To make his case for the various instruments necessary to break these countries free of their traps, Collier spends the first part of the book providing convincing explanations as to how and why the bottom billion have become trapped. Seventy-three percent of the bottom billion countries have recently been in, or continue to be in, a civil war. These civil wars last for an average of seven years, reduce growth by 2.3 percent a year and cost a country and its neighbors an average of 64 billion dollars. Rather than blaming civil wars on social grievances such as exclusion or repression, Collier finds that countries with a low level of income, slow economic growth, and/or dependence on primary commodity exports are most prone to civil war. Once a cycle of civil war and violence begins in a country, it is often difficult to break free, because, according to Collier, having recently been involved in a civil war increases a country’s chances of entering into another civil war in the near future. Natural resource wealth, in addition to increasing a country’s propensity for civil war, also creates its own trap. In Collier’s view, natural resources can be a curse, because of “Dutch Disease”, which makes a country’s other export activities uncompetitive, and causes commodity price volatility. Countries of the bottom billion are often too poor to harness the wealth they gain from natural resources, such that other sectors of the economy remain stagnant, prohibiting future economic development. The third of Collier’s traps, the trap of being landlocked, occurs when a country is resource scarce and has poor transportation links to the coast, either through its own fault or through having the bad luck of having neighbors with poor infrastructure. Without access to a coast, countries have difficulty integrating into global markets. For countries that cannot access the coast, the most they can hope for, says Collier, is relying on their neighbors for growth. However, when their neighbors are similarly trapped in one of the four traps, development is next to impossible. Convinced that one of the above four traps, or any combination thereof, is responsible for the deteriorating economic status of the bottom billion, Collier outlines the measures necessary to break the traps and stimulate economic development. These measures are aid, military intervention, laws and charters, and trade policy. The extent to which each measure will be useful depends on the particular trap of each country and therefore requires careful consideration of each country’s context. Nevertheless, Collier is optimistic that his suggestions will do the job and that the will to enact them exists. When a conflict trap exists, aid can be both beneficial and detrimental. Large amounts of aid can make a coup more likely, but they can also improve security in post conflict situations and alleviate some of the causes of conflict, such as slow growth and low income, when there is good governance. Collier notes that in countries with a natural resource trap, “aid is fairly impotent” because a lack of money is not the problem, but rather, how that money is distributed by the government (p. 107). When a country’s landlocked position contributes to its poverty, aid is necessary to boost consumption, but it is unlikely to stimulate overall growth. Collier suggests, however, that directed aid that contributes to improving the country’s transportation sector, and infrastructure may have better results for the long-term development of the country. Collier is more optimistic than Easterly about the potential benefits aid can have in countries that suffer from bad governance traps. However, he is also careful to lay out very specific guidelines about how and when to implement aid in such a situation. He further cautions that aid is not a cure-all. Though certainly not pro-war, (and condemning the Iraq war throughout the book), Collier does see a role for military intervention, especially when countries are caught in a conflict trap. Military intervention can be used to restore order, maintain post conflict peace, and prevent coups. In instances where military intervention is necessary, Collier warns that countries should be prepared to maintain a military presence there for a decade. Moreover, Collier makes a call to Germany, Japan, and other developed countries that have thus far been absent from recent military interventions, so that the United States, Britain, and France do not have to continuously bear the burden. When discussing the need to revise laws and establish charters, Collier recognizes a role for both the developed and developing world. Some current laws in the Western world contribute to the bottom billion’s poverty. For instance, Collier places blame on banks in developed countries, as they often hold deposits from the wealthy of the bottom billion, money that has likely been obtained through corruption or bribery. To resolve this issue, Collier recommends creating a system through which banks should report any potentially corrupt deposits. He also notes the need for stricter regulation of bribes, recognizing that it is not uncommon for resource extraction and construction companies, in particular, to bribe the governments of the bottom billion. On the part of the bottom billion countries, Collier sees the need for five international charters: a charter on natural resource revenues, a charter for democracy, a charter for post conflict situations, a charter for budget transparency, and a charter for investment. One wonders whether this is too large an agenda and whether countries and companies would really be willing to sign onto so many international agreements; Collier, however, is optimistic and believes that through Western consumer pressure and government pressure such changes can be implemented. The fourth and final measure Collier advocates is a change to current trade policy, though he is quick to assert that these changes will do nothing to break countries out of conflict traps. For the other three traps, trade is important, and as such, developed countries such as the United States must do away with the high level of subsidies it affords its agricultural sector. Many developed countries must also end their practice of tariff escalation. Collier does not lay all the blame on the West’s trade policies, but also criticizes the high levels of domestic protection that many of the bottom billion countries enforce. While being a proponent of free trade, Collier also argues that the bottom billion should receive temporary trade protection from Asia as they seek to break into the global market. Though more moderate on his view on the usefulness of aid, Collier is not without his own biases. He is certainly pro-growth and pro-capitalism, stating at one point, “Mao made his own invaluable contribution [to China’s economic success] by dropping dead” (p. 67). However, nearly all of his arguments are substantiated with economic analysis, and he is quick to point out whether his results have been peer reviewed or are only initial findings. Written for people with limited knowledge of economics, Collier presents his ideas in The Bottom Billion in an easy-to-understand manner. Anyone interested in why sub-Saharan Africa and other countries are so poor and in how the Western world can help improve the lives of the world’s most impoverished individuals must read this book. Admittedly, Collier’s answer to that question is not as easy as Sachs’ who believes that increasing aid is the solution, but neither is it as frustrating as Easterly’s answer, which is that there is no answer. Instead, Collier demonstrates that the answer lies somewhere in between, where aid plays a role, but not the only role, and where military intervention, international charters, and trade policies also have a responsibility.